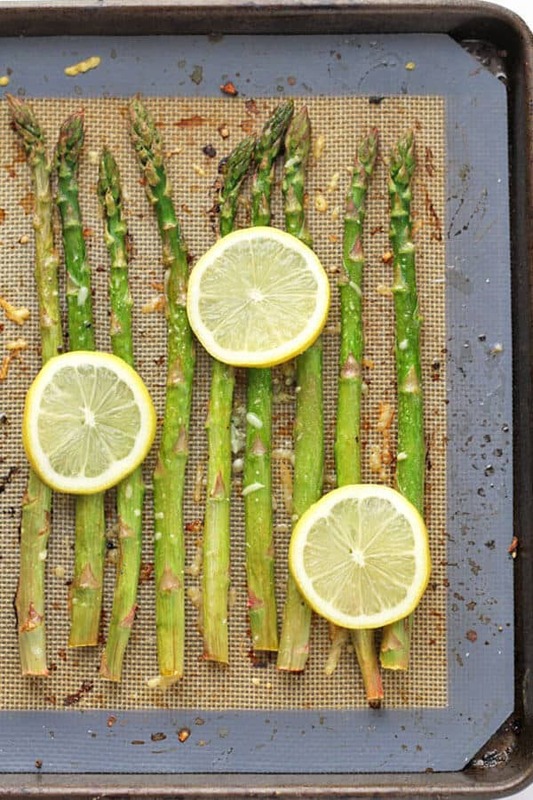 All you need is 7 everyday ingredients, a baking tray and 15 minutes to put together this restaurant quality Roasted Lemon Parmesan Asparagus. The perfect side dish for your Easter feast! Spring has well and truly sprung for the Northern Hemisphere and fresh asparagus bunches are everywhere whenever I visit a supermarket or fruit store. Not to mention the amount of recipes I’ve seen popping up with asparagus as the hero ingredient. I love using asparagus in recipes like curries or pasta, but I think it’s at its best when roasted. Of course, you can simply roast asparagus in some olive oil and salt and pepper. But there’s just something magic when vegetables are roasted with parmesan cheese, don’t you think? Add a little lemon and garlic to the equation and you’ve got yourself a certified flavour explosion. This Roasted Lemon Parmesan Asparagus is a restaurant quality side dish that couldn’t be simpler to prepare. Impress your family and friends and pop this on the table this Easter. Asparagus is packed full of goodness including Vitamins A, C & K and folic acid. And 5 spears counts as 1 of your 5 serves of veg! You probably already have them on hand right now, but if you don’t you’ll be able to easily use them for other recipes also. 15 minutes fast. Probably shorter. I doubt it will take you 5 full minutes to prepare. Why have regular old roasted asparagus when you can sprinkle it with lemon, garlic and parmesan and make it a flavoursome side dish? You want to remove the tough woody ends of asparagus spears before cooking. There’s two mains ways that you can do this – bend and snap OR chop. I’m team chop. There’s many a tutorial out there advocating for bending and snapping the ends off asparagus spears, but this is one “hack” I wouldn’t recommend. Whilst it’s super satisfying to hear the snap, there’s no consistency in where the asparagus breaks off, and you could easily lose perfectly edible asparagus. And I just hate wasting food! 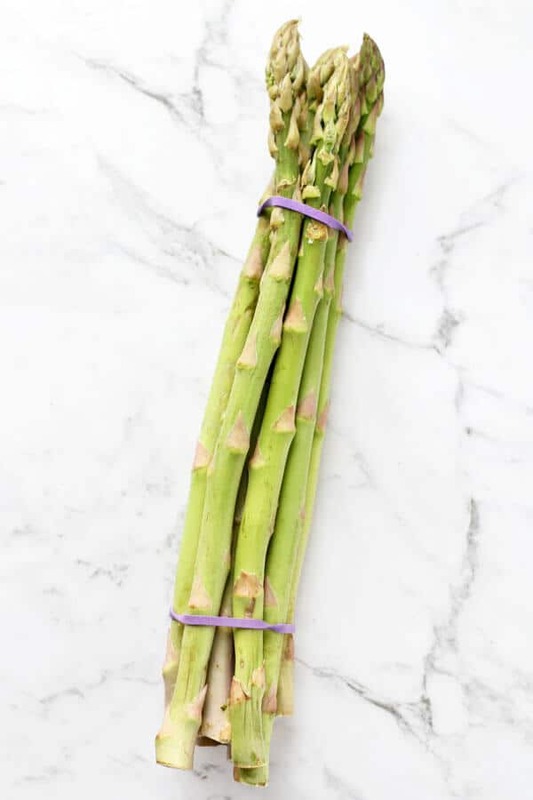 Instead, simply place the asparagus bunch on a chopping board and cut where the spear goes from white to green, approximately an inch from the bottom. You can also run your knife from the bottom of the stalk and cut where you find the least resistance. With this method, you easily get rid of the tough ends at the same time with minimal effort. Pre-heat the oven to 200C / 400F. 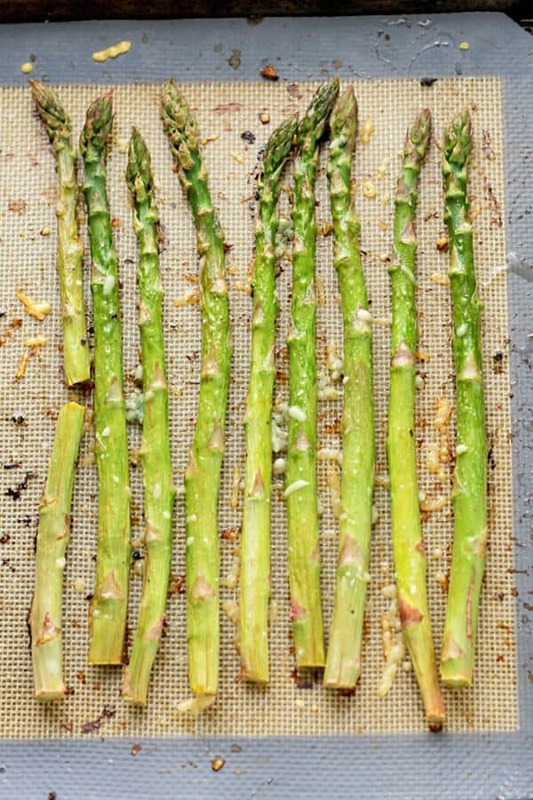 Wash and trim your asparagus spears then on a baking tray. Cover the asparagus with lemon juice, minced garlic and olive oil and mix well with your hands to ensure all spears are evenly coated. Spread the spears into a single layer, sprinkle with salt, pepper and grated parmesan (as shown in the picture above), then place in the oven for 10 minutes, or until the asparagus is tender. Serve immediately, sprinkling over extra parmesan if you wish. Choose a bunch that has thicker stems. The thinner stems tender to be less tender and more chewy. If you’re serving this dish to impress, sprinkle some extra parmesan over before you serve and pop some lemon slices on top. Fancy. If you’ve tried this Roasted Lemon Parmesan Asparagus I’d love to hear how you enjoyed it! Pop a comment and a star rating below! You can also FOLLOW ME on FACEBOOK, INSTAGRAM and PINTEREST to keep up to date with more delicious recipes. Wash and trim hard ends of the asparagus spears (see note 1), then place the spears on a baking tray. Cover the spears with the lemon juice, minced garlic and olive oil, then mix well with your hands to ensure the spears are evenly coated. 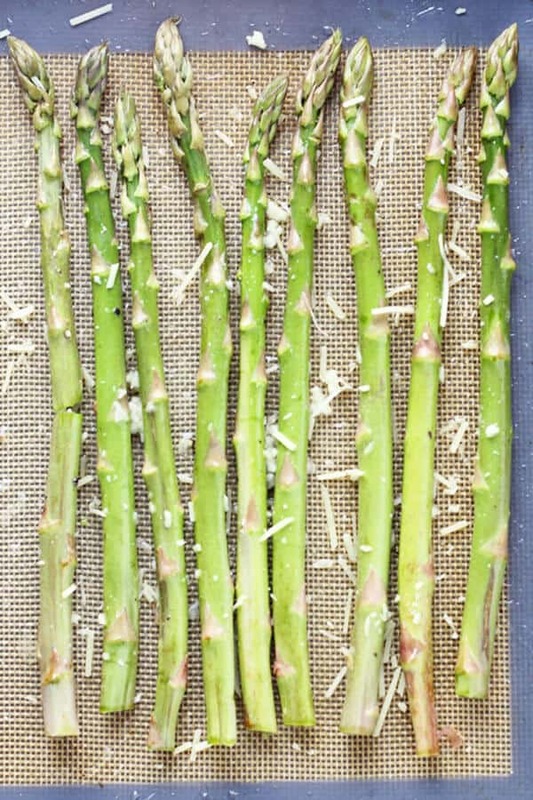 Spread the spears into a single layer, sprinkle with salt, pepper and grated parmesan and then place in oven for 10 minutes, or until the asparagus is tender. Serve immediately, sprinkling over extra parmesan cheese if you wish. 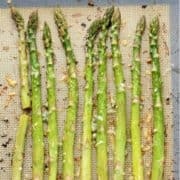 Simply place your rinsed asparagus bunch on a chopping board and cut where the spear goes from white to green, approximately an inch from the bottom. You can also run your knife from the bottom of the stalk and cut where you find the least resistance. Choose a bunch of asparagus that has thicker stems. The thinner stems tender to be less tender and more chewy. If you're serving this dish to impress, sprinkle some extra parmesan over before you serve and pop some lemon slices on top. Fancy. Nutrition information is calculated using a nutritional calculator and is based on one serve.